I finally received my orders from the Nordstrom Anniversary Sale 2018. I placed my order on the first day of the Early Access, and I can’t believe it took almost 2 weeks to arrive. Usually Nordstrom does a good job shipping items right away. So I do apologize that my review on the items that I bought from the Nordstrom Anniversary Sale did not arrive in time for the first day of the Public Access. Just like last year, I wanted to do a thorough review on the items I bought (i.e. sizing, keeping it, returning it, etc), so that you all know what to expect when you place your order. I guess next time, I’ll select the ‘Buy Online & Pick Up In Store’ option. Also, if any of these items are sold out, I highly recommend bookmarking it. There’s a possibility that they will re-stock. So as soon as it is back in stock, you will have the page readily available! So without further ado, here is my full review! SIZING: These skinny jeans fit true to size. I bought a size 28 and now I wish I bought my usual size (27). Due to weight gain from cancer treatments, I wasn’t sure if I should size up with skinny jeans. REVIEW: I love them! I’ve always been a fan of Madewell jeans. Their jeans are so flattering. Even though I sized up, it is still a keeper! They have a slight stretch, so they feel very comfortable. I loved that it has a button fly and it’s high-waisted. VERDICT: Keep. Unless I can exchange it for a size 27. SIZING: Fits large. It says it fits true to size, but I felt like I was swimming in it, and I bought a size small. I probably needed an XS or even a XXS. REVIEW: This “coat” has a boxy fit. I did expect it to have an oversized fit, but this felt like I just put on a sheet over me. I also didn’t expect this to be as thick as a regular coat, but the fabric of this is so thin. I have cardigans that are thicker than this. I was hoping this coat would be more of a chicer cardigan. But it just didn’t work out that way. SIZING: I guess it runs half a size large. I ordered a 7M and it fits perfectly. My usual size is a 7.5. I have room for wool socks just not super thick wool socks. If you are into wearing thick socks in the winter, then I recommend ordering your usual size. REVIEW: I like it. The shearling lining in the interior will definitely keep my feet warm. I like how there is a side zipper. It will make it easier to slip on the boots. It also comes with brown leather laces if you want to switch out the white laces. SIZING: Fits small. I recommend going one size up. I ordered a size 28 and it fits perfectly (usually a 27). 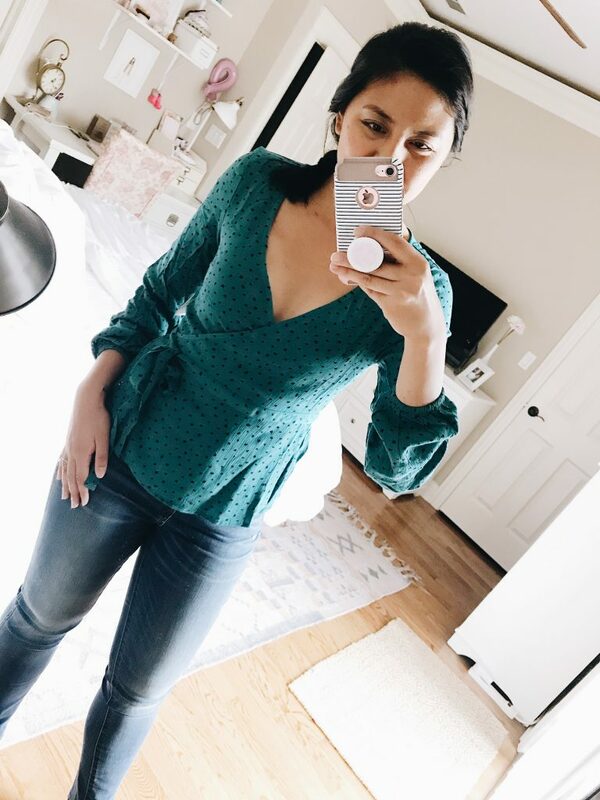 REVIEW: It’s high-waisted which I like. 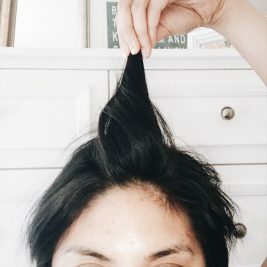 I’m 5’4″ and its the perfect cropped length for my height. I love that it is made with corduroys. It’s a nice change of fabric. SIZING: Fits small. I recommend going one size up. I ordered a size 6 and I’m usually a 4 or a 2.
REVIEW: It’s soft and not scratchy at all. It has a semi-loose fit. 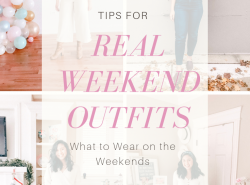 If I wanted an oversized fit, I recommend going one size up (so 2 sizes up from your normal size). I really think this sweater would look great as an oversized fit! SIZING: Too Small. I ordered a 27 and I barely could get it past my thighs. Hence, why you don’t see a picture of it. REVIEW: Really wished these worked. The size guide was totally off. I probably need to go 3 sizes up to potentially have it fit. SIZING: Fits true to size. I ordered a size small and it fits comfortably. REVIEW: Love it! The opening of the sleeves has some stretch which makes it easy to scrunch up (sometimes I like to scrunch up my sleeves). It’s a bit low cut, but I think a good fitted cami or a lace bralette would look great with it. I’ve been shopping the NSale for years, and I love seeing items I have purchased from previous NSales return year after year! Full disclosure, although these items have returned, there may be a slight variation of it from previous years but nevertheless, still the same item and they’re still amazing. SIZING: Fits true to size. I’m wearing a size small. 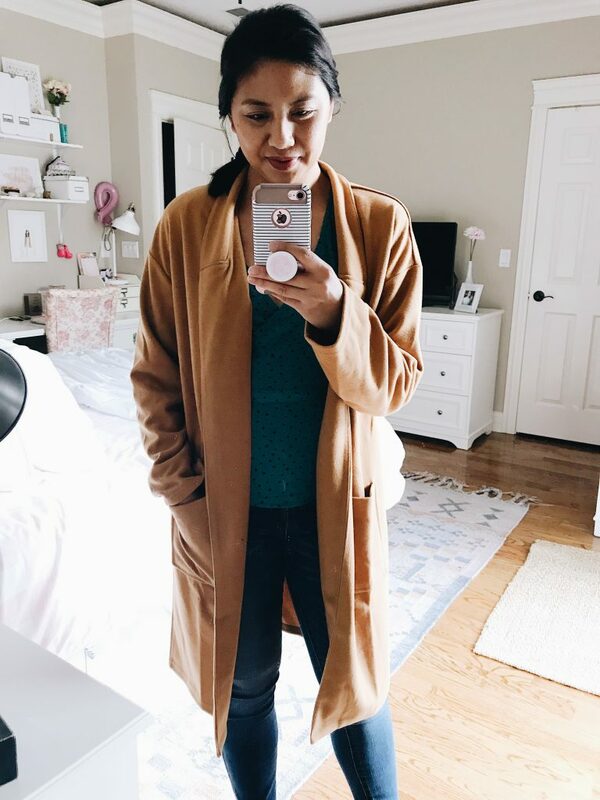 REVIEW: The suede jacket first appeared a few years ago and ever since it first appeared I have wished I bought it during the NSale. So when it came back to the sale last year, I immediately snatched it. It is one of my best purchases yet! I’ve worn it with anything and everything. It’s one of those things you just throw on and it immediately transforms your outfit. 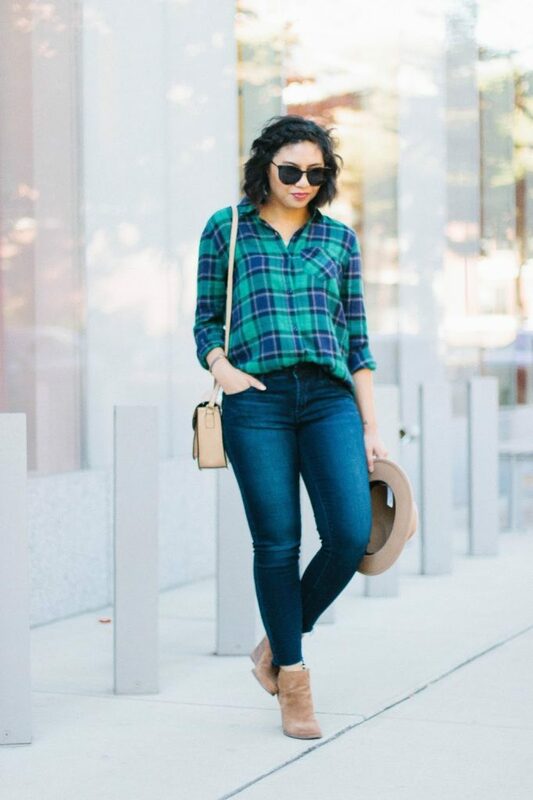 REVIEW: Who doesn’t love a good plaid shirt during Fall? I love the length because it is no longer than the usual plaid shirt. This means it can look great with leggings or jeans! It is lightweight, which makes it easy to layer with. SIZING: Fits true to size. If you’re in between sizes, I recommend sizing up. REVIEW: I bought these booties a few years ago and they’re one of my go-to booties for the Fall. I loved them because they’re wedges! We all know wedges are comfortable. This year’s booties are slightly different because they have a zipper and a side slit. If you want the same exact pair as mine, I was able to find it on Amazon. SIZING: Fits true to size. I bought a size small and it had room to layer. 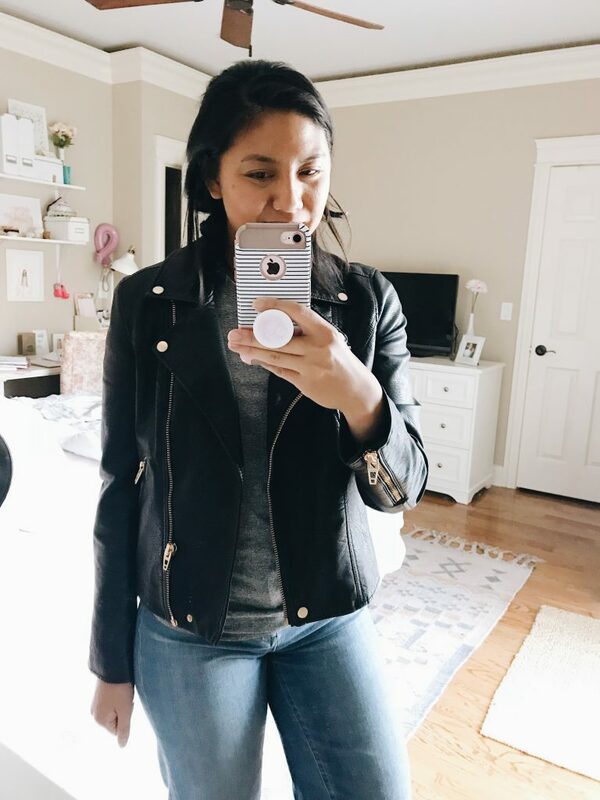 REVIEW: This moto jacket is my go-to when I travel. 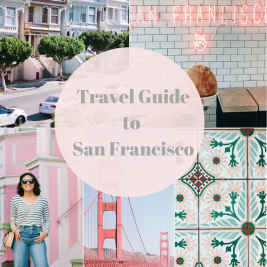 I don’t know, maybe it helps me feel like I got it together when I travel? This year’s moto jacket is slightly different because they have added a detachable hood. You heard me, you can remove the hood if you want! Which I think is an awesome feature! 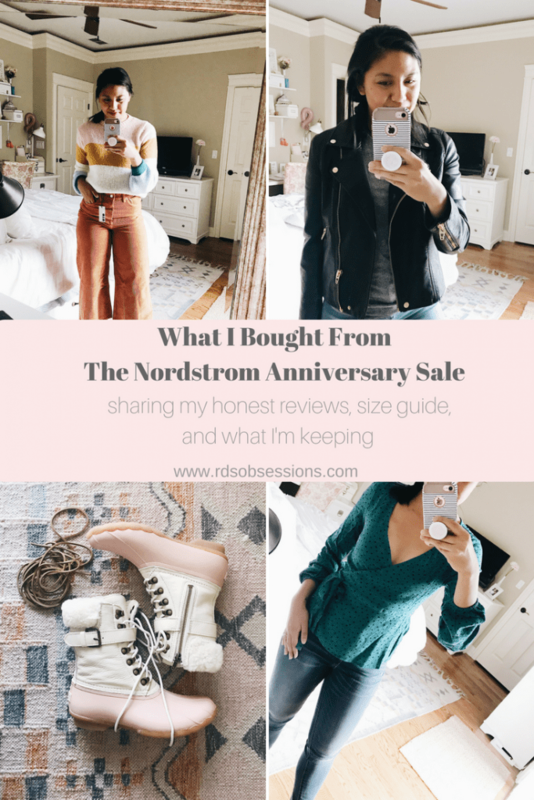 Alright, that is it with my Nordstrom Anniversary Sale 2018 Review! I hope you all find it to be helpful and I do hope if any of these are out of stock, that they return! Because they are priced so well! I love seeing what others got from the Sale. So far I have placed way too many orders but I keep seeing all this cuteness and it makes me want to order more, lol. LOVE the Sperry’s and wrap top you kept. Haha that’s how I feel about the sale too! Thank you Andrea! 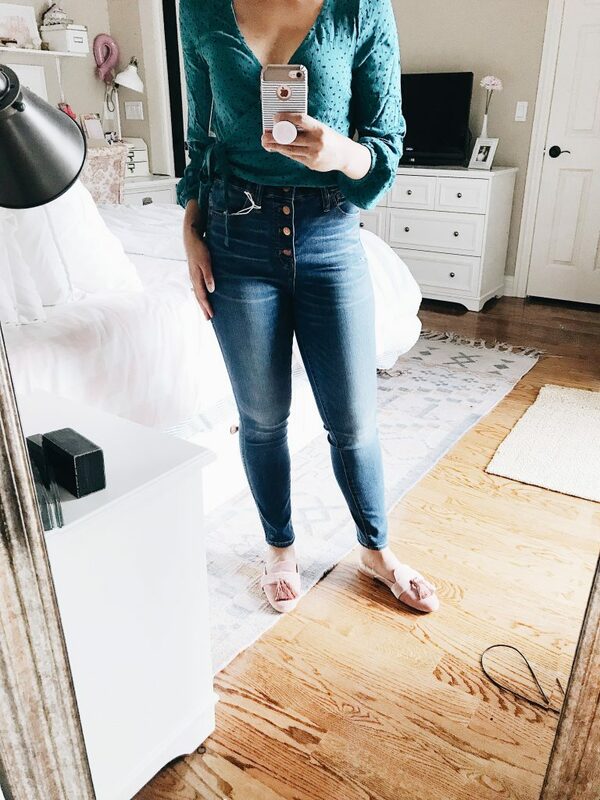 I LOVE those jeans from Madewell! 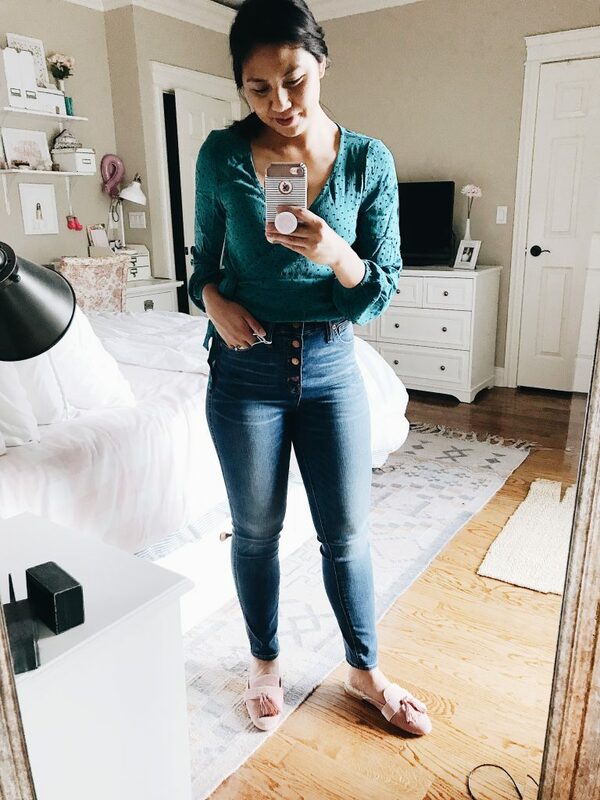 I bought a pair of jeans from the Nsale too! They are from Frame! You look so chic and I hope that you can exchange them for a size down! Thank you V! Oo I like Frame’s jeans too! Love that striped sweater and your Blank NYC jacket. Great picks! I love the mules you picked! Pastels look great on you! Thanks Noelle, but I actually didn’t buy the mules. They are an old pair I had! So many cute purchases, Rach! 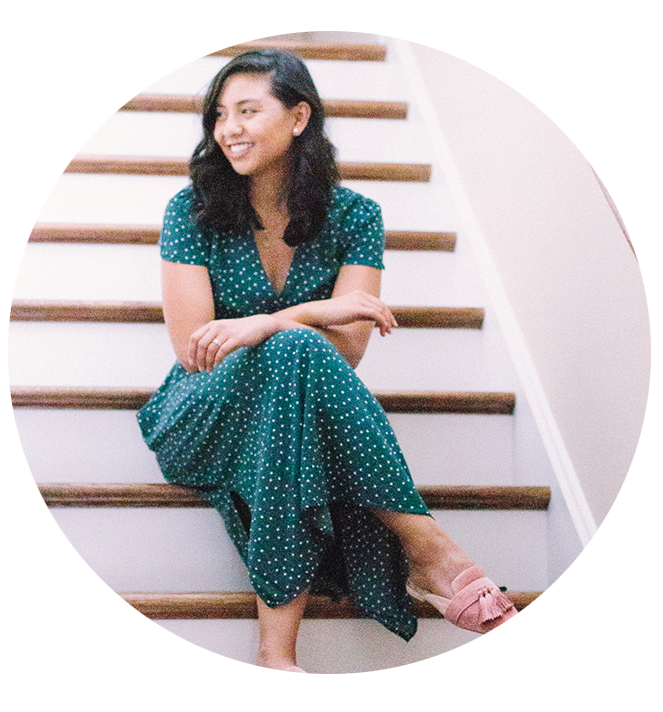 I still haven’t tried on any of the Madewell jeans – maybe now’s my chance!! Girl, now is the perfect opportunity to! What pretty pieces! I love these! 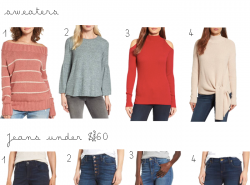 You chose some awesome pieces from the NSale!! I love those pink Sperry boots and those corduroy pants! Cute picks! Thank you for sharing. So many cute picks this year! Loving the striped sweater. You picked up so many great pieces! 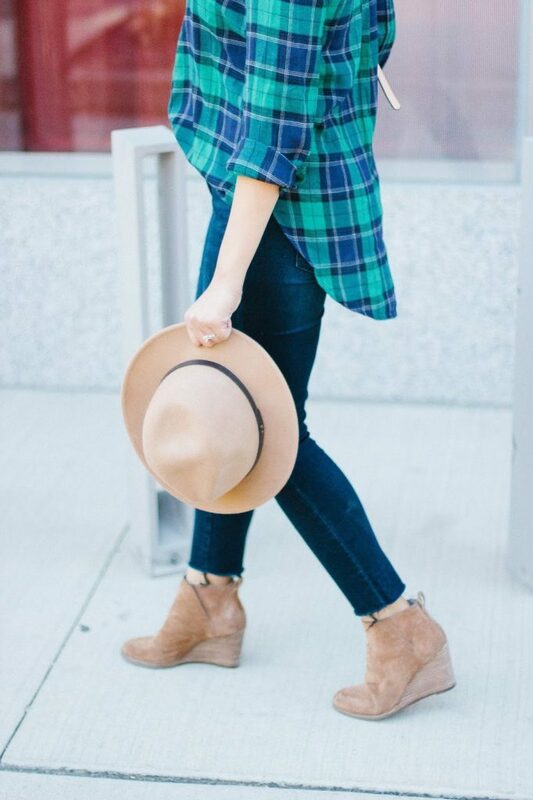 I love the plaid shirt and the wedge booties! Love your picks! Especially that bold striped sweater and black bomber jacket! And love the way you have portrayed/ try on haul! I was so glad to see you’re keeping those sperry boots! How cute!! Wow you managed to snag a lot of great pieces! 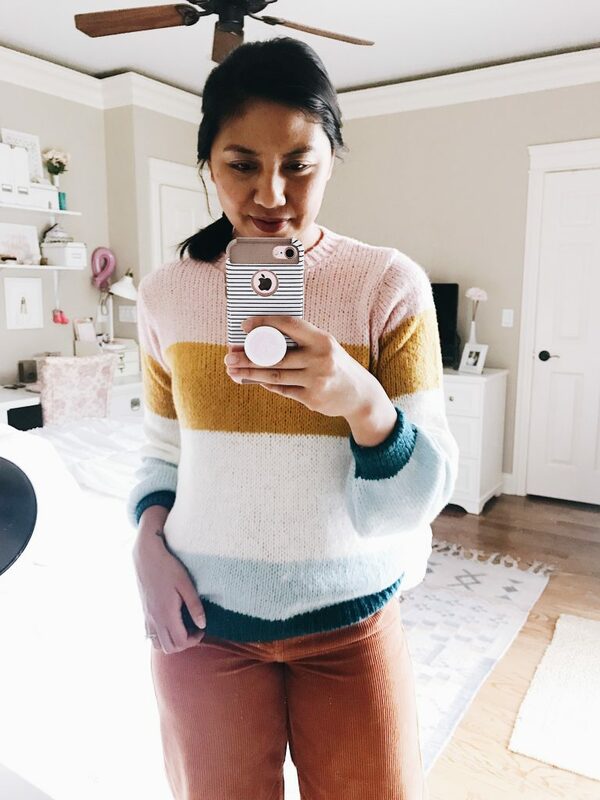 I really love that colorblock sweater – I was actually eyeing it but I decided to get something else. In fact, I only picked up one thing this year (a pair of booties for fall). Sometimes that all we need! 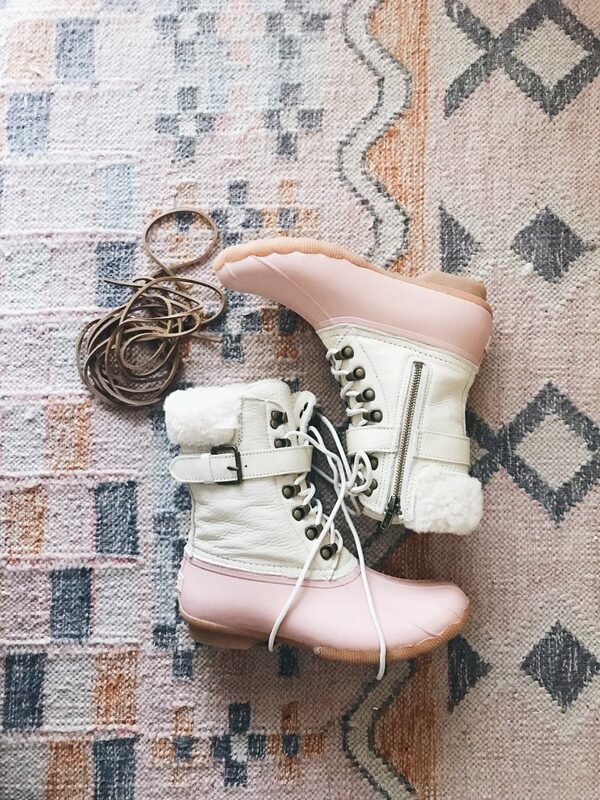 A good pair of booties is a good one! So many great pieces! I think everyone should have a classic moto jacket! So many good buys! Love the Lucky booties! I really like camel coat! It is perfect! Thanks for sharing! I wished it worked out for me! Ugh that is a shame! Hopefully they have better coats next year! You bought a lot of great items babe. 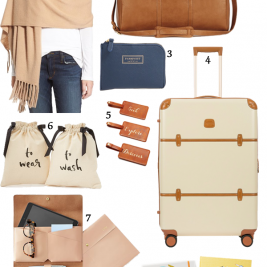 Definitely a steal – especially the suede jacket. 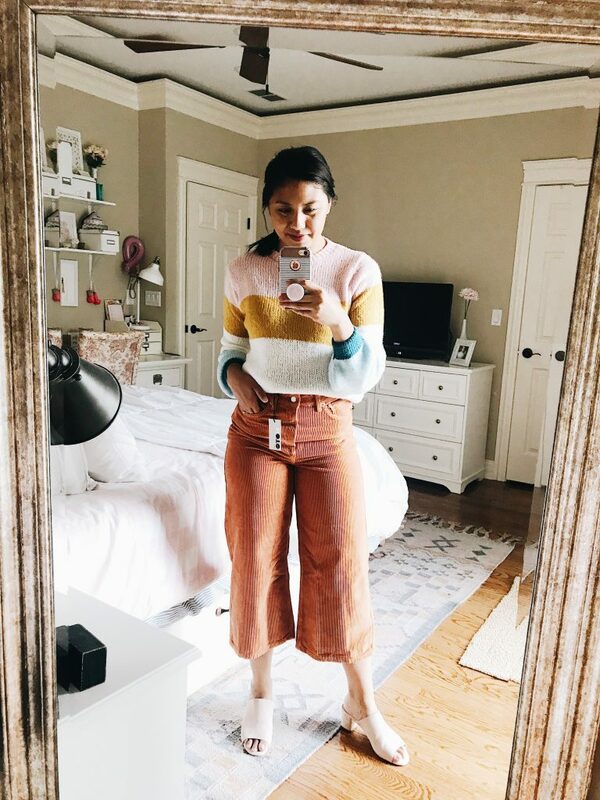 Girl, those wide legged corduroy trousers from Topshop are a dream! I loved that entire look, actually. It’s making me miss all the comfy Fall clothes! I’ve worn them already and LOVE them! You found some great pieces!! I love how you paired that striped Topshop sweater with those fabulous orange cords! 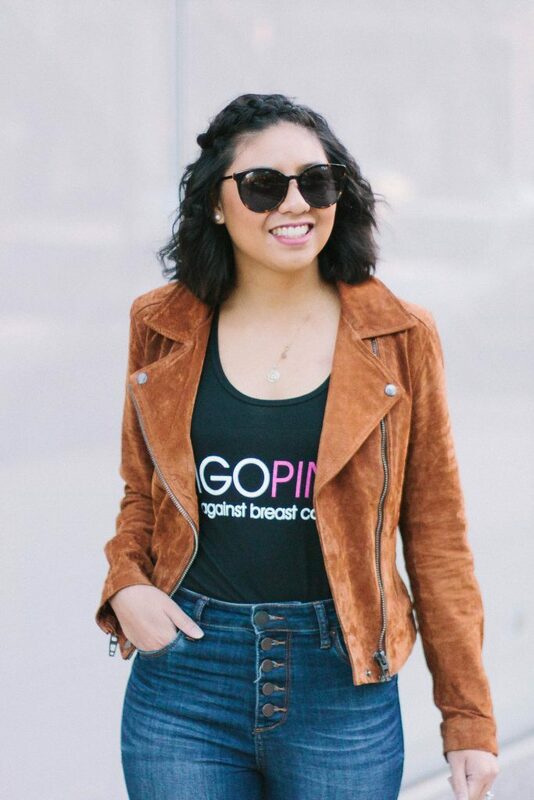 It’s the perfect Fall outfit!